When times are hard, doomsayers are aplenty. The problem is that if you listen to them too carefully, you tend to overlook the most obvious signs of change. 2011 was a bad year. Can 2012 be any worse? Doomsday forecasts are the easiest to make these days. So let's try a contrarian's forecast instead. Let's start with the global economy. We have seen a steady flow of good news from the US. The employment situation seems to be improving rapidly and consumer sentiment, reflected in retail expenditures on discretionary items like electronics and clothes, has picked up. If these trends sustain, the US might post better growth numbers for 2012 than the 1.5-1.8 percent being forecast currently. Japan is likely to pull out of a recession in 2012 as post-earthquake reconstruction efforts gather momentum and the fiscal stimulus announced in 2011 begins to pay off. The consensus estimate for growth in Japan is a respectable 2 per cent for 2012. The "hard-landing" scenario for China remains and will remain a myth. Growth might decelerate further from the 9 per cent that it expected to clock in 2011 but is unlikely to drop below 8-8.5 percent in 2012. Europe is certainly in a spot of trouble. It is perhaps already in recession and for 2012 it is likely to post mildly negative growth. The risk of implosion has dwindled over the last few months - peripheral economies like Greece, Italy and Spain have new governments in place and have made progress towards genuine economic reform. Even with some of these positive factors in place, we have to accept the fact that global growth in 2012 will be tepid. But there is a flipside to this. Softer growth means lower demand for commodities and this is likely to drive a correction in commodity prices. Lower commodity inflation will enable emerging market central banks to reverse their monetary stance. China, for instance, has already reversed its stance and has pared its reserve ratio twice. The RBI also seems poised for a reversal in its rate cycle as headline inflation seems well on its way to its target of 7 per cent for March 2012. As inflation fears abate and emerging market central banks begin to cut rates, two things could happen Lower commodity inflation would mean lower interest rates and better credit availability. This could set a floor to growth and slowly reverse the business cycle within these economies. Second, as the fear of untamed, runaway inflation in these economies abates, the global investor's comfort levels with their markets will increase. Which of the emerging markets will outperform and who will get left behind? In an environment in which global growth is likely to be weak, economies like India that have a powerful domestic consumption dynamic should lead; those dependent on exports should, prima facie, fall behind. Specifically for India, a fall in the exchange rate could not have come at a better time. It will help Indian exporters gain market share even it global trade remains depressed. More importantly, it could lead to massive import substitution that favours domestic producers. Let's now focus on India and start with a caveat. It is important not to confuse a short-run cyclical dip with a permanent de-rating of its long-term structural potential. The arithmetic is simple. Our growth rate can be in the range of 7-10 per cent depending on policy action. Ten per cent if we get everything right, 7 per cent if we get it all wrong. Which policies and reforms are critical to taking us to our 10 per cent potential? In judging this, let's again be careful. Lets not go by the laundry list of reforms that FIIs like to wave: increase in foreign equity limits in foreign shareholding, greater voting rights tor institutional shareholders in banks, FDI in retail, etc. These can have an impact only at the margin. We need not bend over backwards to appease the FIIs through these reforms - they will invest in our markets when momentum picks up and will be the first to exit when the momentum flags, reforms or not. The reforms that we need are the ones that can actually raise out. Sustainable long-term growth rate. These have to come in areas like better targeting of subsidies, making projects in infrastructure viable so that they draw capital, raising the productivity of agriculture, improving healthcare and education, bringing the parallel economy under the tax net, implementing fundamental reforms in taxation like GST and the direct tax code and finally easing the myriad rules and regulations that make doing business in India such a nightmare. A number of these things do not require new legislation and can be done through executive order. 1. Which of the following is NOT TRUE according to the passage ? 2. Which of the following can be said about the present status of the US economy ? 4. Why does the author not recommend taking up the reforms suggested by FII's ? 5. Which of the following is TRUE as per the scenario presented in the passage? 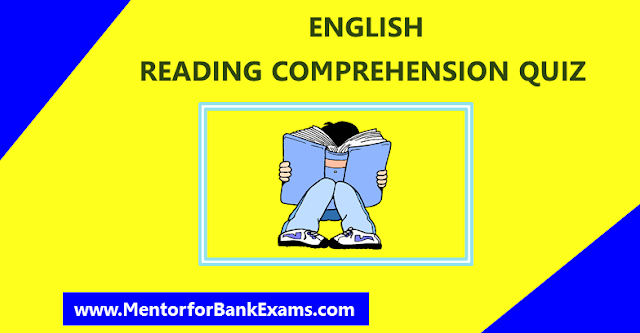 DIRECTIONS (6 – 8): Choose the word/group of words which is most similar in meaning to the word/group of words printed in bold as used in the passage. DIRECTIONS (9 – 10): Choose the word/group of words which is most opposite in meaning to the word/group of words printed in bold as used in the passage. 1. (e) All are true. 2. (d) There is a chance that in 2012 the economy would be better than what has been forecast. 3. (d) The current Economic Scenario. 4. (a) These will bring about only minor growth. 5. (e) None is true. 6. (a) The meaning of word Draw (verb) as used in the passage is : Influence. Hence, the words Draw and Entice are synonymous. 7. (a) The meaning of clock (noun) as used in the passage is : time keeping device. Hence, the words Clock and Watch are synonymous. 8. (d) The meaning of Abate (verb) as used in the passage is : to become less. 9. (c) The meaning of Myraid (adjective) as used in the passage is : numerous. Hence, the words myraid and few are antonyms. 10. (a) The meaning of Tepid (Adjective) as used in the passage is warm. Hence, the words tepid and moderate are antonyms.